Where all my cleansing/whole30/healthy resolutioners at? Personally, I didn’t plan on doing a New Year’s cleanse but I’ve been struggling with some health stuff and decided to give it a go after the holidays. 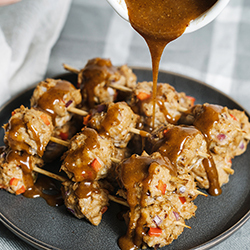 Either way, whether you’re deep in Whole30 or you’re more into give-me-the-whole-donut, these Whole30 Chicken Teriyaki Meatballs are for you. This teriyaki sauce is tangy and sweet (without any sugar! what?!). 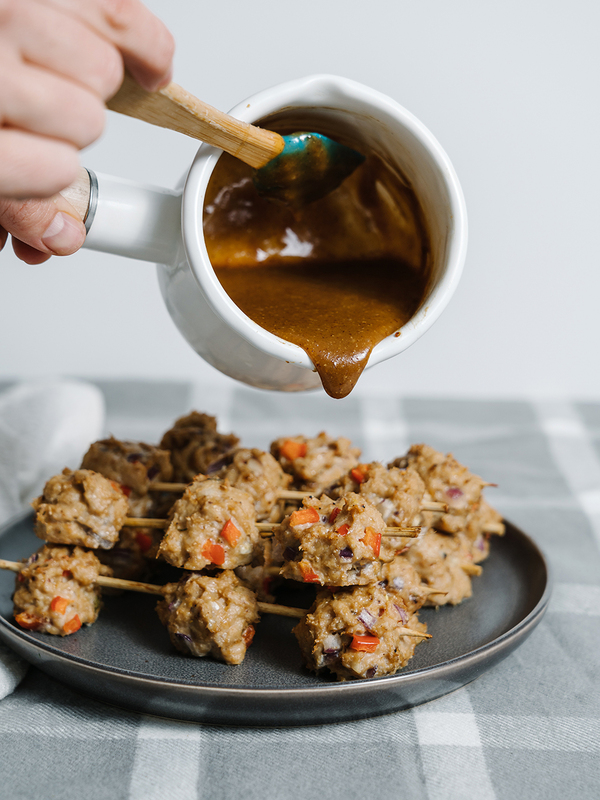 I honestly doubted that I could achieve the perfect teriyaki flavor without brown sugar and told my husband I was borderline shocked at how rich, creamy, and perfectly sweet this sauce came out. Not only that, but I absolutely love it paired with these Whole30 Chicken Teriyaki Meatballs. These can be thrown together in about 30 minutes so they are a go-to in this house. There’s a few ways I like to use this recipe so I thought I would go ahead and share them all so that you can get creative and make them your own. 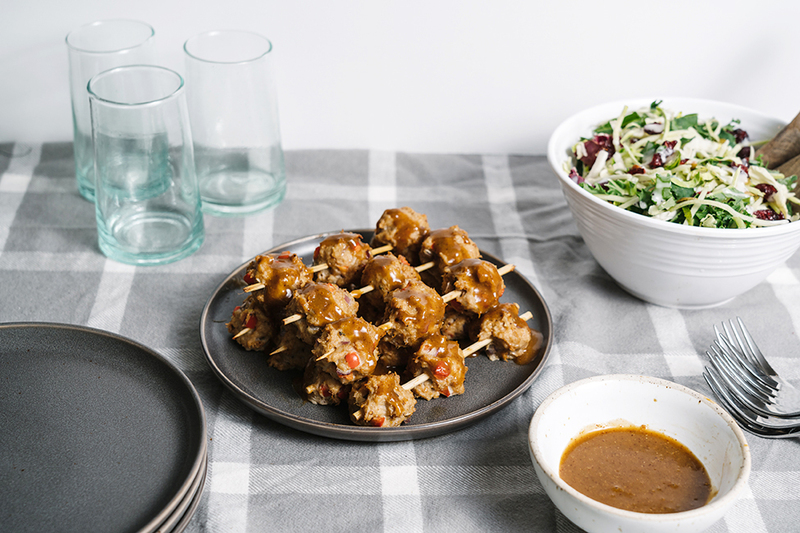 The biggest reason for the skewers is I like to use them as an appetizer for a crowd. 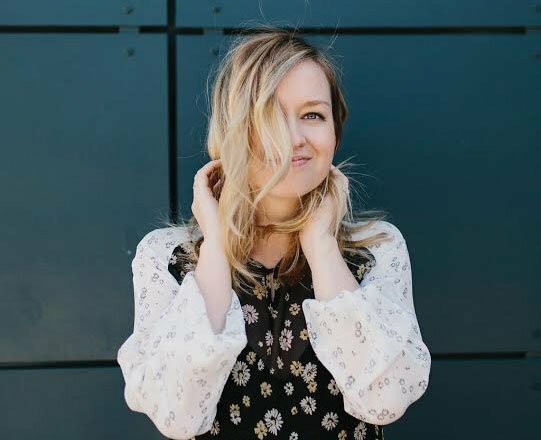 Psst, the Superbowl is coming up–this is the first weekend of February, if you’re just coming back from a cleanse I don’t know that diving in to pizza, nachos and cheese, and beer will sit quite right. This is a crowd pleaser and won’t send your stomach into overload. I like to drizzle the sauce over the meatballs and leave some on the side for dipping. The skewers make it easy to eat and they look great. If you’re making it for your family or your lunch prep for the week you can totally leave off the skewers. I like to serve this over zucchini noodles and spiralized sweet peppers. I sauté the noodles and pepper over medium for about 5 minutes and then drain off an excess liquid, pour in the sauce, and add the meatballs. 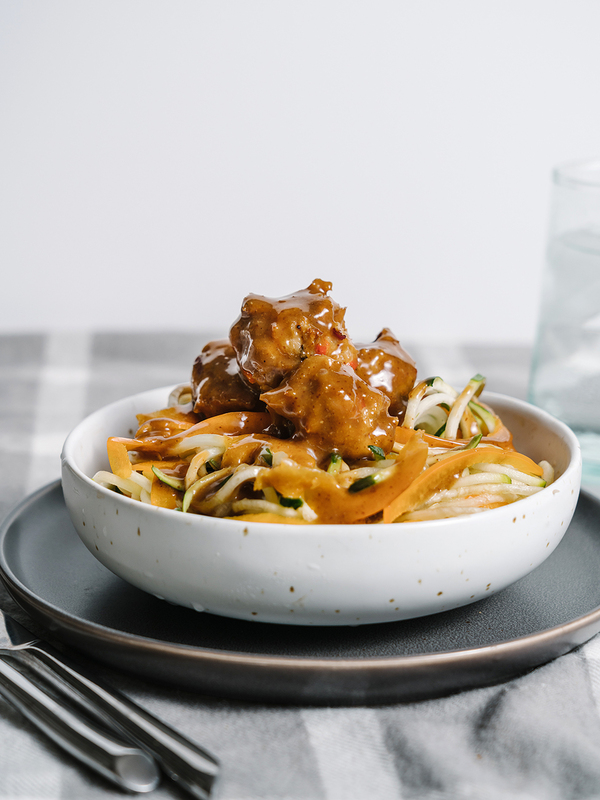 You could also sauté up a frozen stir fry veggie bag and cook the grain of your choice and drizzle this sauce over top with the Whole30 Chicken Teriyaki Meatballs, boom easy dinner or lunch meal prep. 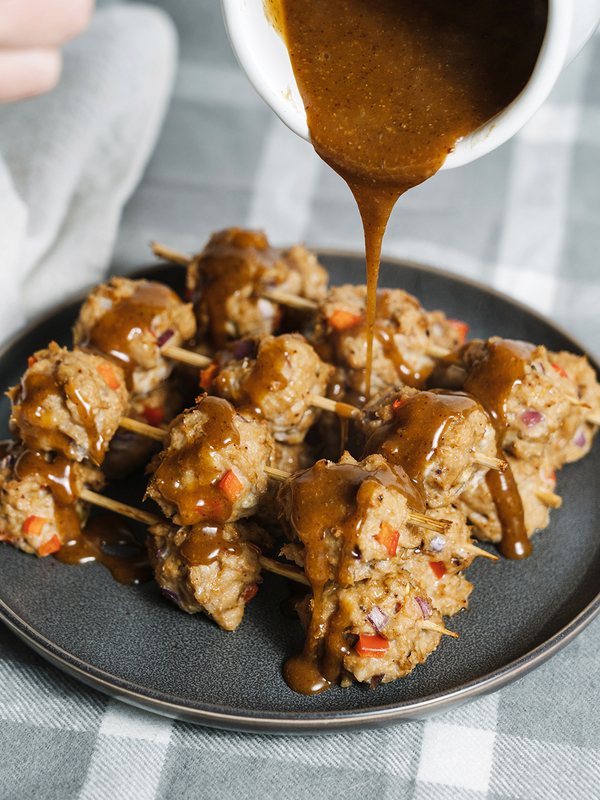 This teriyaki sauce is tangy and sweet– without any sugar! 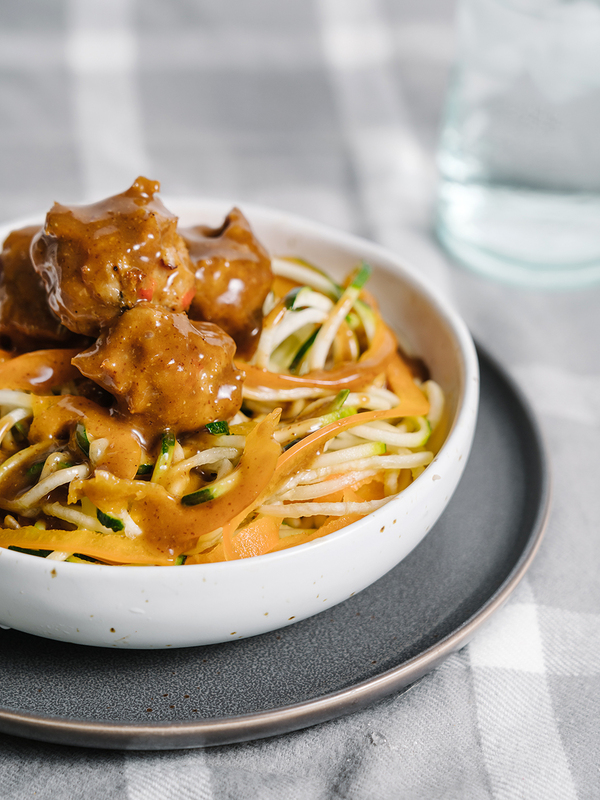 These meatballs can be thrown together in about 30 minutes and served as an app, grain bowl, or over zoodles. Preheat oven to 350 degrees. Soak skewers in water. 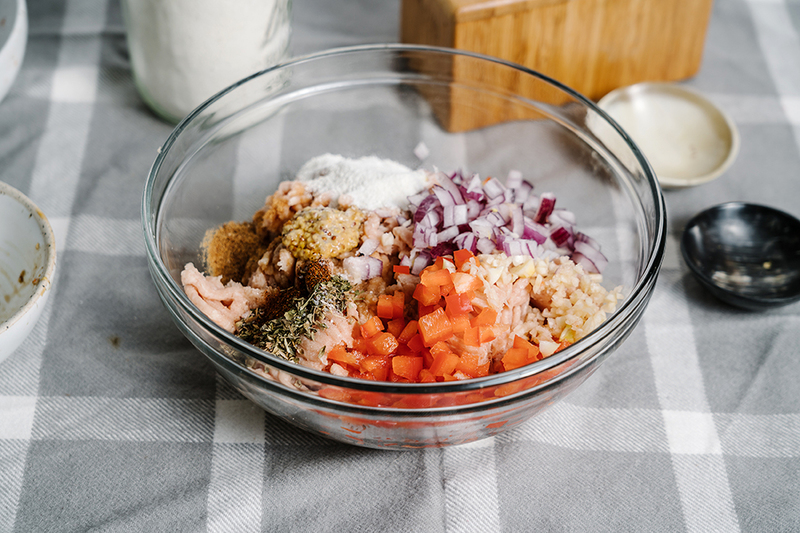 Combine all meatball ingredients in a bowl and mix well with hands or fork. Form into small balls using your hands or a small icecream scoop (dip scoop in water between meatballs to help prevent sticking). 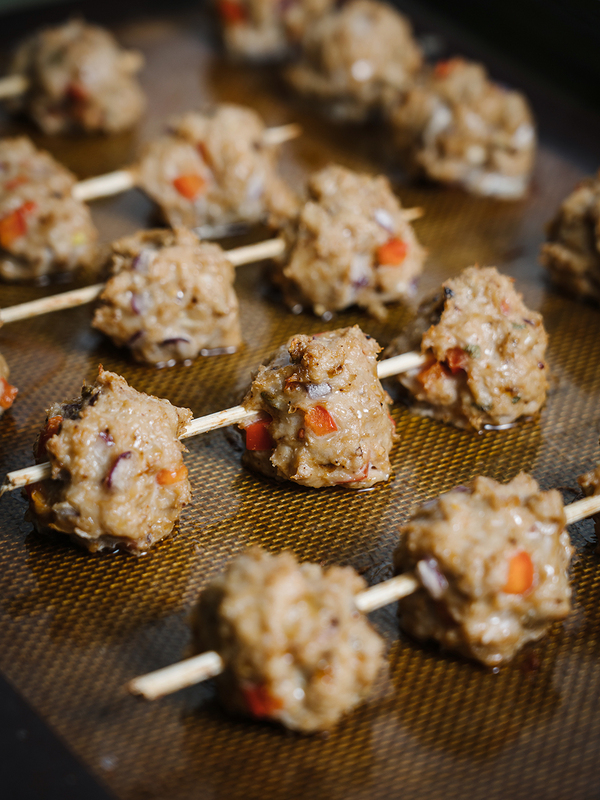 Place balls on a sheet pan lined with parchment or a silicone baking mat. After you’ve formed all your meatballs, gently stick skewer through 3 meatballs. Pour blended sauce into a small saucepan over medium heat. Whisk water and tapioca flour together and add to sauce. Stir over medium-low for 3-4 minutes until thickened. Remove from heat and pour over meatballs or serve as a dipping sauce. See the blog for more ways to use this recipe! 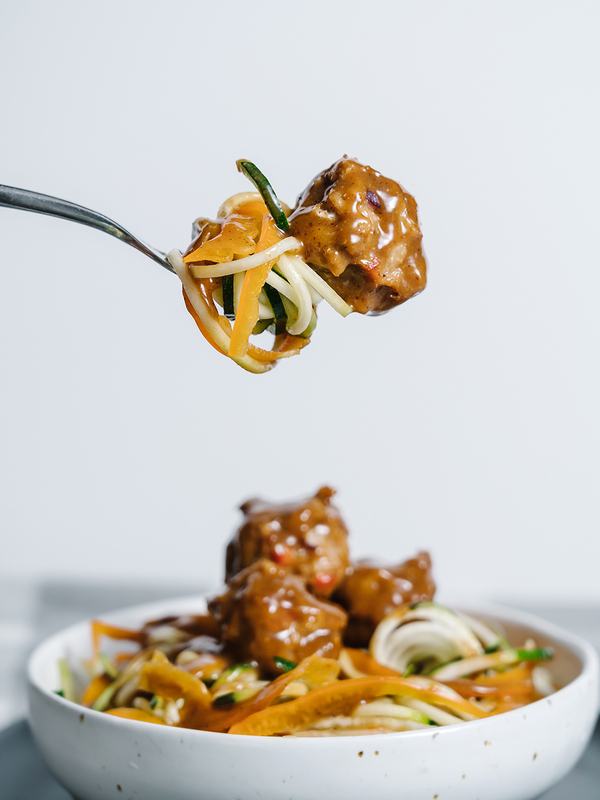 *I prefer these meatballs to have a bit of texture so I don’t cook my onions and peppers but if you don’t prefer that, I would quickly saute them. **If you don’t use a date, you can just whisk the sauce, but I find a processor makes this sauce really creamy. Check out more Whole30 recipes HERE! These look so good! I just bought some ground turkey I might that I could use for these! These look so yummy! I recently made the turmeric chicken recipe you posted a few month ago and it’s going into our regular rotation. Yum! Going to try these this weekend! This looks great! I pinned it. Have you tried the “caramel” sauce made with dates? So so good. No, but that sounds delicious! We just made these last night and have no leftovers because they were THAT good!